Twenty-year old Jim left England in 1889 and traveled to Orcas Island with his brother Fred where they homesteaded property north of Cascade Lake. In 1891 their mother and four siblings left England to join them on Orcas. The homestead site was sold and the family moved to a farm. Jim and Fred were incredibly bored on the farm and so, when Jim was offered a job in Africa, his mother decided to pack up the family and move to British Columbia. Jim eventually worked in Seattle as an optician, watch repairer, and a lens grinder. In 1897 he traveled to Skagway Alaska. While here, he was quoted as saying that “if you don’t get drunk in Skagway you won’t get rolled”. He went north to stake his claim but returned to Washington in 1913 after the death of his mother. To earn money he converted many of his photos into hand-tinted postcards and sold them at Templin’s Store in Eastsound, and at Orcas and Deer Harbor stores. Jim sold his Orcas Island home in 1943 and moved to California where he died on July 8, 1953. The tinted postcard above may be one of his. After the big earthquake in 1903, apparently the beaches in Dyea were shifted in such a way that the tide came in a mile further than before. 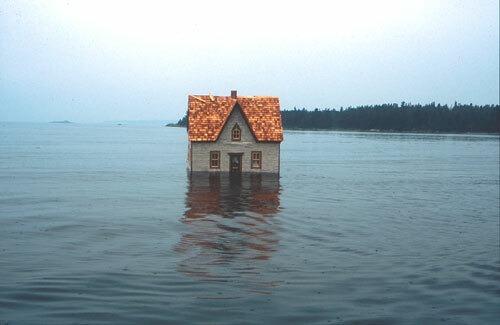 This caused some of the abandoned cabins and cottages to float away. New York Times July 6, 1903. A Sioux City man wrote back to Iowa about his experiences in the North in November 1899. As he was leaving Atlin, he said he saw a tree with a piece of paper that said simply “Homeward bound from hell and mosquitoes”. He also related that quite alot of building was going on in Skagway and that in fact there was a shortage of carpenters. He said the permanent growth of the town was wonderful and where last winter he had seen half of the residents living in tents, there was hardly a tent to be seen in the winter of 1899-1900. He said there were lovely residences and they were even building a college…. Dubuque Daily Herald, November 16, 1899. Otto was born in 1857 on the Isle of Man. He emigrated from England to San Francisco. In 1897, he heard the stories of men walking off ships in San Francisco with suitcases full of gold from the Yukon gold fields. He had boat building skills that would be valuable in the north so at age 42 he set off for Skagway, Alaska. He is said to have smuggled $20,000 to Lake Bennett in a bale of oakum. 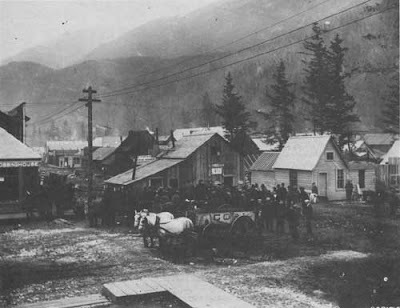 Otto crossed the Chilkoot Pass and traveled to Bennett, British Columbia. Bennett was the start of the lake and river system that led to Dawson City. Here he worked as general manager for the Bennett Lake and Klondike Navigation Company. With the extension of the White Pass & Yukon Route railway to Whitehorse in 1900, Otto moved to Milhaven Bay on Bennett Lake near Carcross where he set up a sawmill and supplied railroad ties to the WP&YR. His wife Kate joined him here. They lived on a houseboat and Kate spent her time cultivating flower and vegetable gardens which flourished in the intense northern sunlight. Otto’s sawmill closed shortly after the end of the gold rush and he turned his interest to mining. In 1911, he started a mining operation in partnership with Stanley McLellan and Lugwig Swanson. He called the mine Ben-My-Chree. The name in Manx spoken on the Isle of Man, translates to “girl of my heart”, and was a tribute to Kate. The small mine employed up to sixty men, but was short-lived as an avalanche roared down the mountain burying the mine and tragically killing Stanley McLellan and his wife. After the accident, the Partridges stopped mining and built a homestead, also named Ben-My-Chree, in the spectacular wilderness valley just 106 km south of the Yukon border. In the rich glacial silt they cultivated two acres of formal flower gardens in this most unlikely setting. Forty varieties of flowers flourished here and grew to amazing heights. The delphiniums were ten feet high, the pansies and poppies were five inches in diameter. In 1912, sternwheelers began stopping at Ben-My-Chree to bring mail and supplies and to stock up on fresh vegetables from the Partridge’s garden. In 1916, Otto entered into an agreement with the British Yukon Navigation Company to bring tourists down the lake from Carcross to visit the gardens. Word quickly spread and soon steamers carried 9,000 passengers annually to Ben-My-Chree. The scenery at Ben-My-Chree entranced visitors. The combination of towering snowcapped mountains, the rushing glacial river, the long white sandy delta, the turquoise lake, and the incredible gardens were breathtaking. A houseboy received visitors at the dock while Kate, dressed in long formal wear, welcomed visitors at the garden gate. In the drawing room, Kate entertained with organ music. Otto conducted tours of the gardens and, a gifted storyteller, he captivated his audiences with stories from the gold rush days. During the 1920’s Ben-My-Chree was considered a key place to visit among the social elite of that time period. 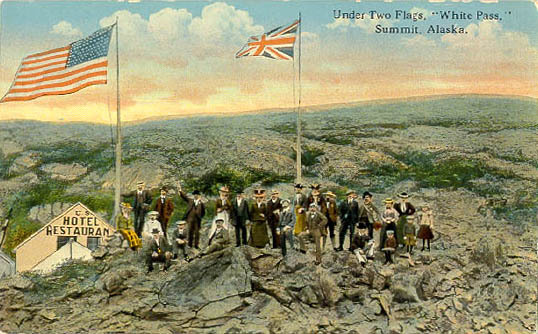 Many wealthy people including the Prince of Wales, President Roosevelt, Lord and Lady Byng, and numerous silent picture movie stars made the long trip. 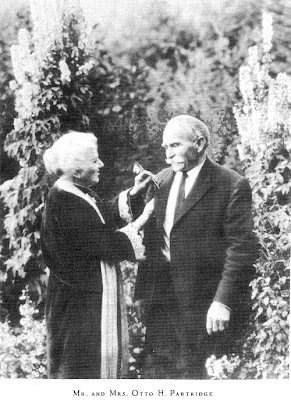 Otto died at age 73 on this day, June 28, 1930 and Kate a few months later at the age of 77. 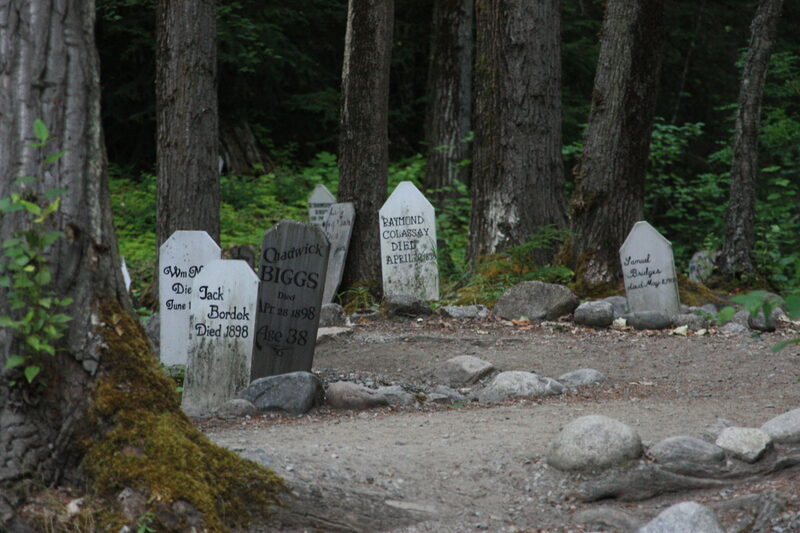 They are buried in the Whitehorse Pioneer Cemetery. Martinsen Trail to North Star Gold; What Lies Beneath website for the Whitehorse Cemetery. Mr. Dedman was born in 1858 in Missouri and came to Skagway from Portland. He first started a laundry here in 1898. His wife, Clara, joined him several months after his arrival. She landed two days after Soapy Smith was shot. They purchased a two story mercantile building, moved it from State Street to Broadway and turned it into the Golden North Hotel in 1907. They had two kids, Henry Alaska and Nelda. Henry got into photography early on and the Dedman’s store is still in business on Broadway in the summer. 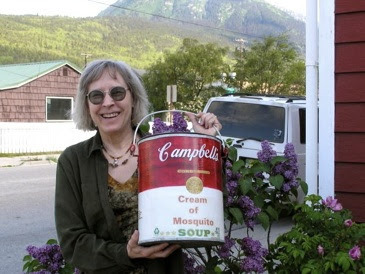 His granddaughter and great granddaughter still live in Skagway year round and also have a store on State Street called Granny’s Gallery. 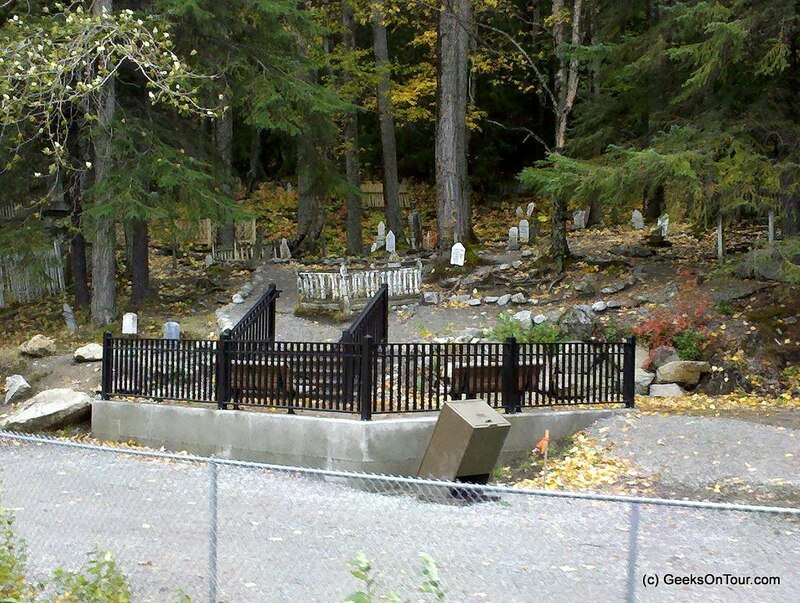 George died on this day June 27, 1925 in Skagway and is buried in the Pioneer Cemetery with Clara, Henry and his wife Bessie. Seen above is Betsy acting goofy in front of Granny’s Gallery. So the other day on my daily trek between AB and city hall I passed a walking tour led by one of the RO girls. She was saying that Mabel could be called the biggest extortionist since she was getting something from someone relating to the Peniel Mission. I am intrigued! The only Mable that I have in my database is Mabel Ulery who was the Peniel Mission founder in 1898. She later became Mabel Holmes Cox and wrote a book in 1968 called the Lady Pioneer, which I have ordered and can’t wait to read! The “extortionist” is seen above…. If anyone knows the details of this intriguing story, please let me know! Ida May was Marshal Dillon’s daughter. She married Charles Olsen or Olson and on this day, June 24, 1908 she gave birth to a son, Philip E. Olson but unfortunately Ida May died in childbirth. She is buried in the Gold Rush Cemetery and has a delightful grave with a long flower pot on the top that often has wildflowers blooming. Her son, Philip was adopted by Carl Larson and Edith Feero Larson. Philip stayed in Skagway and was a White Pass employee. His daughter still lives in Skagway part of the year. The Larsons went on to have four more kids, Stewart, Uremia, Ellen and Velma. I have never heard what became of Charles Olson, his father, perhaps he was too young to care for his son and left town. Ida May Dillon’s grave is seen just to the left of the new black platform above. The sidewheeler Idaho was built in 1860 by John J. Holland when he was only 17 years old. Holland went on to build many more steamships. It is said that the state of Idaho was actually named after this ship! 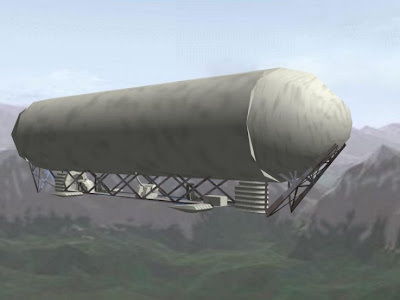 Anyway, it ran on the Columbia River taking passengers and cargo through the tricky rapids for many years. 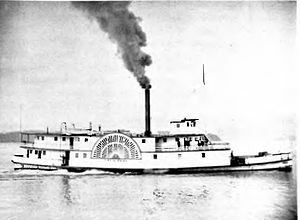 Captain John McNulty took her up and down the river for many years and made lots of money for the Oregon Steam Navigation Company. In 1881 she was completely rebuilt with a new hull and paddle wheels at a cost of $20,000. In 1882 she ran the mouth of the Columbia several times before getting through, which was quite a feat at that time. She then made the fastest time up to the Puget Sound ever recorded. She worked various routes in the Sound until 1894 when she was sold to the junk firm of Cohn & Cohn. They removed the machinery and sold her to Dr. Alexander DeSoto. He refitted her as a charitable hospital for the returning gold rushers who were maimed and sick. After 38 years of work it was fitting that the little Idaho served the poor as a hospital for 11 years. After that she gradually fell apart and became part of the harbor of the growing city of Seattle. There is a plaque there that remembers Dr. DeSoto and the hospital. Mr. Pierre Humbert Jr. was a millionaire Boston Banker who had a passion for moving things. So he started the Humbert Transportation Company and the Alaskan and Northwester Railway Company in 1898. He is most famous for transporting 200 cattle from Seattle to Haines to drive to Dawson to feed the starving miners in November 1897. But even more amusing is the story which appeared in the Evening Times (Washington D.C.) of April 20, 1897 for Cripple Creek, Colorado on April 17. Well, obviously they did land and perhaps Mr. Humbert decided he would stick to land-based transportation following this little air adventure. Mr. F.A. 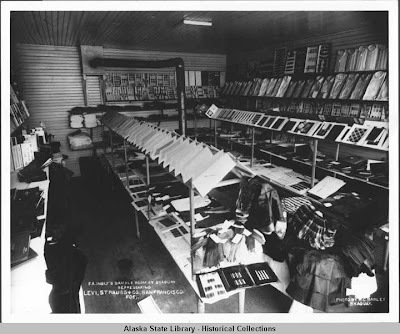 Insly ran the Levi, Strauss Company sample room in Skagway, probably around 1900. A ‘sample room’ provided display space for the wares of visiting salesmen called ‘drummers’. This Barley photograph shows the various options someone would have in ordering. Reminds me of catalogs today and ordering online.